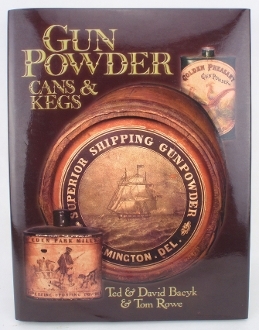 Gun Powder Cans & Kegs by Bacyk & Rowe. Book features old powder cans and kegs which are colorful, historical and highly collectible. To date there have been minimal references for these collectors to determine rarity or value of cans and kegs. This book is focused on the major American manufacturers: du Pont, Laflin & Rand, American Powder, King and Hazard, plus their related companies. Published 1998. Hardcover 266 pages.